The only thing is that I'm not sure if we need to put anything extra in for them now it has no shelves or that the items I am about to order are going to be okay? 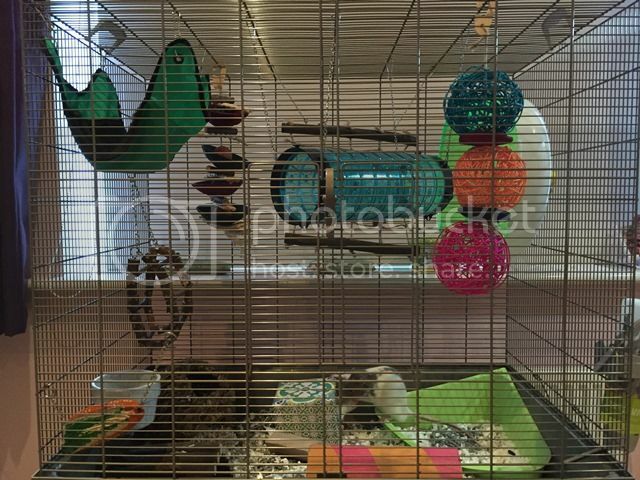 I would add some ropes crisscrossing the cage at various heights, and a basket or two (pound shops sell some good ones) which you could fill with substrate and bedding. I can only spot one rat in those picture - does he have a companion? Rats should ideally live in groups of 3 or more, but definitely not on their own. No he has a brother Euan, my husband didn't want any rats so two was the maximum he would agree to otherwise it would have definitely been more. I have seen the ropes that attach to the cages at ratRations. Would you get different lengths to criss cross or the same and would you just attach the baskets with cable ties? Sorry for so many questions, just want to get it right. You could try ledges/perches, you mention you are buying from rat rations, they have a page for them here. I also use the 'nobbly gnawer' from Pets at Home. 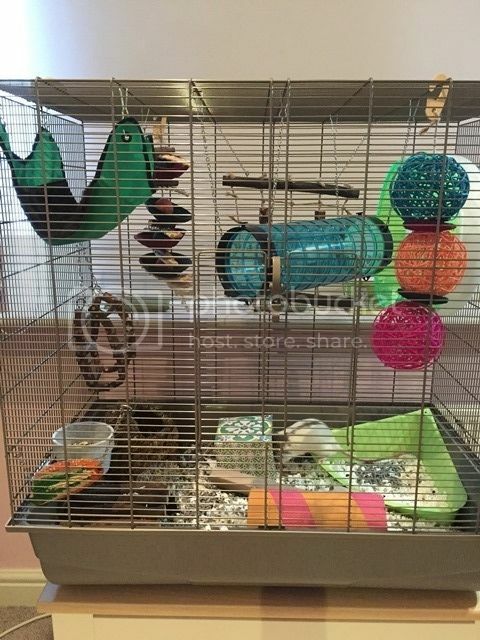 If you find you're spending a lot of money doing up your rats abode there are some free/cheap home made ideas around the forum such as bed sheet ropes, pringle tubes, perches from bottles, and asking for the inside of carpet tubes from your local carpet shop. JeanneNicole wrote: Would you get different lengths to criss cross or the same and would you just attach the baskets with cable ties? Sorry for so many questions, just want to get it right. Lots of things can be plaited into ropes, I like using washing line rope from cheap shops, and you can either do single lengths, or if you get something long (like these) then you can zig zag it. That's great will get the clips with my order. How do you wash your ropes? I just give them a scrub in mild washing up water and hang them to dry, unless they are fabric, in which case they go in the washing machine with the hammocks.